In recent years, manufacturers have introduced and improved mower safety features that include roll-over protection structures, seatbelts, four-wheel steering and ergonomics. While seat belts and ROPS are essential mower safety features, managers focusing on safety and comfort when purchasing new mowers also need to understand the training needs of their operators and mechanics and explore the options for providing staff with the needed training. Providing the materials is only the first step in ensuring the safe operation and maintenance of mowers. Hands-on experience is essential. “Managers need to review these items with the employee to assure that they understand how to safely operate the mower for the first time,” he says. “Employees should be allowed to practice with the mower in a controlled environment before heading out into the field. Once the operators and mechanics are comfortable with the mower and its features and functions — especially those specifically related to safety — their next step is to make sure all safety features are functioning properly prior to use. Even after managers have made certain that operators and mechanics are familiar with a new mower’s safety features, they still must be vigilant in ensuring that their staff use the equipment the way that manufacturers intended it to be used. 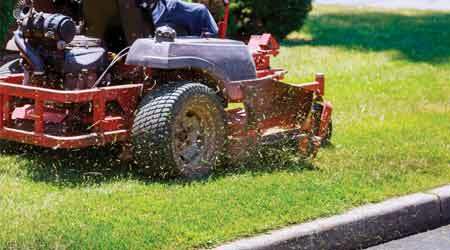 It is not uncommon for operators to push the limits of a mower’s performance and even disable safety features. “If the specification of a mower says you should never mow above 15 degrees slope, then you should not be mowing above 15 degrees slope,” Sooy says. “If the mower is equipped with a discharge chute, then make sure then chute is down. Some landscapers will flip it up because it can improve gas dispersion, but that is a safety feature that needs to be utilized. If a machine is equipped with ROPS, then they are there for a reason, and they need to be flipped up.